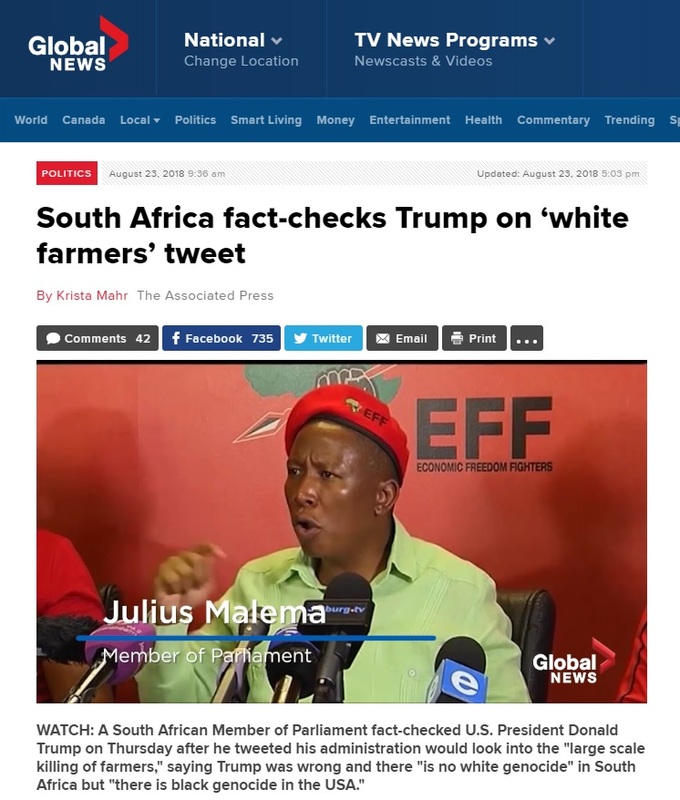 Canada's Global News on Thursday cited an unhinged rant from radical communist leader Julius Malema to supposedly "fact-check" President Donald Trump's tweet about the "large scale killing of farmers" in South Africa. 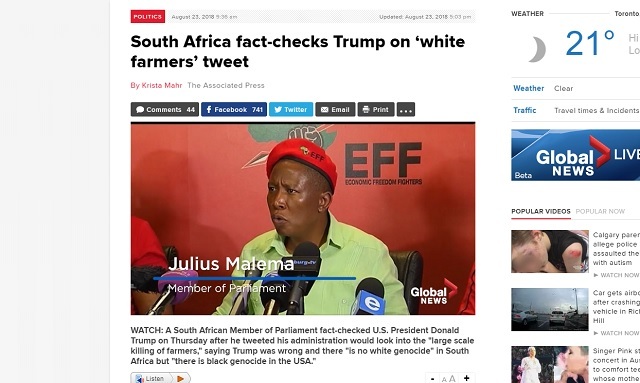 "South Africa fact-checks Trump on 'white farmers' tweet," Global News' headline blared. "WATCH: A South African Member of Parliament fact-checked U.S. President Donald Trump on Thursday after he tweeted his administration would look into the 'large scale killing of farmers,' saying Trump was wrong and there 'is no white genocide' in South Africa but 'there is black genocide in the USA,'" read the subheader. During a press conference held Thursday, Malema said "Jews in Pretoria" are training "a group of white right-wingers" to "kill us" and he's willing to die in order to expropriate white-owned farms without compensation. The EFF commander-in-chief says his party will expropriate land without compensation or die trying. At a media briefing on Thursday at EFF headquarters in Braamfontein, Malema made the shocking claim that a group of right wing extremists are training people to kill members of the EFF over their policy of land expropriation without compensation. �They will kill us for that. There�s a group of white right-wingers who are being trained by Jews in Pretoria to be snipers,� he said. Whether or not the EFF leader has any solid evidence of this is unclear at this point. [...]Speaking about his belief that a farm in Pretoria is being used to train snipers to hunt down members of the EFF, Malema described a war between those who support expropriation without compensation and those who oppose it. �Death is the price we will pay and poverty will come. It�s a war and we must be prepared. Death is the price we are willing to pay, we are not shaken,� the leader of the red berets said. Global News cut those parts out of their report and their video of his statements, instead playing only his attacks on President Trump and his claim there "is no white genocide" in South Africa but "there is black genocide in the USA." The choice of using Malema to "fact-check" Trump couldn't be more strange considering he has repeatedly called for the genocide of white South Africans. He's been arrested for singing "Kill the Boer (white South Africans)" at his rallies. In March, Malema told a large crowd of followers, "we are cutting the throat of whiteness." This is what passes for a "fact-check" in the fake news media. Big Tech and the Democratic establishment are moving fast to try and shut down all alternative media to ensure this is the only type of "fact-check" anyone is allowed to see.